I wrote an op/ed in the Chicago Tribune Friday, applauding the good fathers like my own, and urging all the fathers who fall short of their responsibilities to step up to the plate. I wrote about how Father's Day in my house is not a holiday we celebrate because my three sons have no contact with their own father who abandoned them physically, financially and emotionally years ago. I got a lot of kudos and a whole lot of hate mail. One anonymous blogger called me a sociopath, another said I could not possibly ever have a partner. Someone else said I hated men. Never mind the praise I have for good fathers. Never mind that I grew up with a father all six of his children adored. And who gave them all he ever could, including a role model for someone who has integrity, character and a wickedly dry sense of humor. 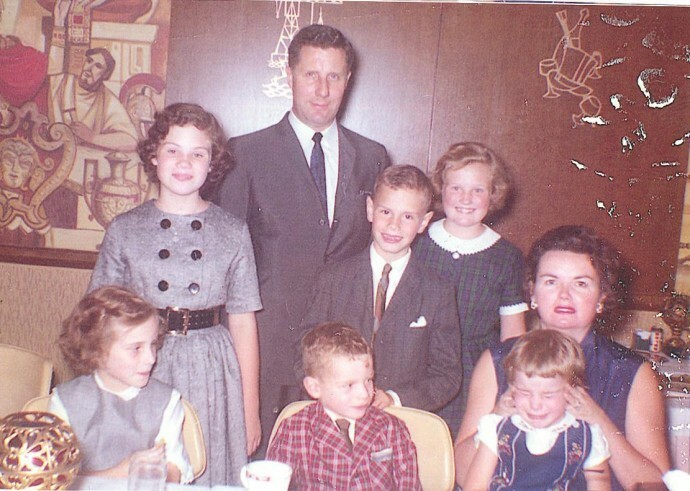 My father, Bill Weldon, with his six children and my mom, Patricia. I'm the one crying. I guess some commenters don't read past the headline. Which is why I call this form of verbal vitriol a "blog by." And I think my father would be amused by it and he would ask me why in the world I was upset by something so ludicrous when I knew the truth. The truth is many men need to step up to their responsibilities. It is not a class issue, a race issue or even a generational issue. It is a human rights issue. Today my oldest son forwarded me an email from the head of a much bigger household. Barack Obama, himself raised by a single mother in the absence of a father, writing from the White House. I grew up without a father around. I was lucky enough to be raised by a wonderful mother who, like so many heroic single mothers, never allowed my father's absence to be an excuse for me to slack off or not always do my best. But I often wonder what it would have been like if my father had a greater presence in my life. So as a father of two young girls, I've tried hard to be a good dad. I haven't always been perfect – there have been times when work kept me away from my family too often, and most of the parenting duties fell to Michelle. I know many other fathers face similar challenges. Whether you're a military dad returning from deployment or a father doing his best to make ends meet for his family in a tough economy, being a parent isn't easy. That's why my Administration is kicking off the Year of Strong Fathers, Strong Families. We're joining with dads across the country to do something about father absence. And we're taking steps to offer men who want to be good fathers but are facing challenges in their lives a little extra support, while partnering with businesses to offer fun opportunities for fathers to spend time with their kids. For example, the Association of Zoos and Aquariums, Major League Baseball and the WNBA are offering discounts for fathers and their kids, and companies like Groupon and LivingSocial will be featuring special offers for activities fathers can do with their children. There are so many good men my boys have the grace to be around. Coach Powell most of all. I wrote about Powell's influence on my sons in an essay in the new book, This I Believe on Fatherhood. So I won't be redundant. But the news is that Coach Powell, Coach Paul Collins and Coach Mike Boyd returned on Friday from a trip to Zion National Park. 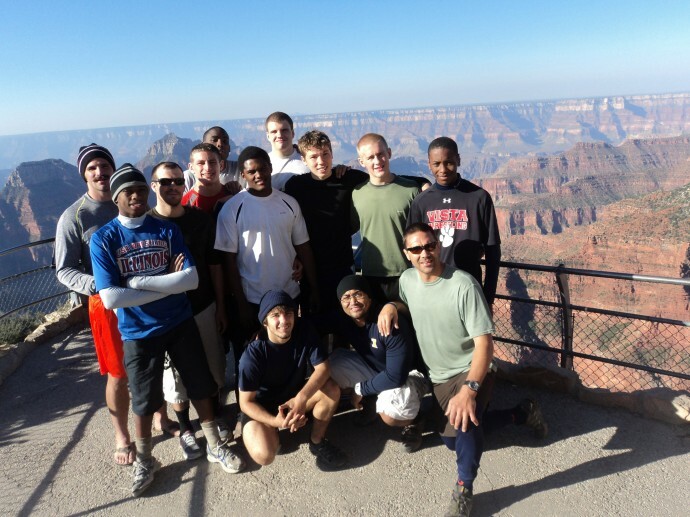 These men volunteered their time for the young men who are seniors on the Oak Park-River Forest wrestling team. It sounds corny and cinematic, but Colin is different since he came home. He acts more like a man. He is calmer. He is more polite. He is more helpful. I saw a similar transformation in Weldon and Brendan after their senior trips, both of them also with Coach Powell. On this Father's Day, I acknowledge that because of the stellar life examples of the men who have mentored all three, my sons will know just exactly how to be a good father. And they can look to the White House and see that a man without a father can grow up not only to be the leader of the free world but a good father as well. And I am more grateful than you can ever know. Beautifully written. Made me want to cry. Not like you are crying in the photo, but close. You received comments from the misogynist fathers rights groups – it’s rarely anything BUT hateful. The Nat’l Fatherhood Initiative provides federal funds to MEN ONLY and did not experience ANY budget cuts. This money promotes marriage. It also funds programs that reunite convicts with their kids — helping men, NOT children. We have no idea if this social experiment will harm children, but apparently that is not a concern. And – father absence? Just another way to bash single moms. One parent can raise a healthy, successful child – and Obama is the best example of that. Children need safe, protective, nurturing care – be that from one person (male or female), two, three, or the entire village.